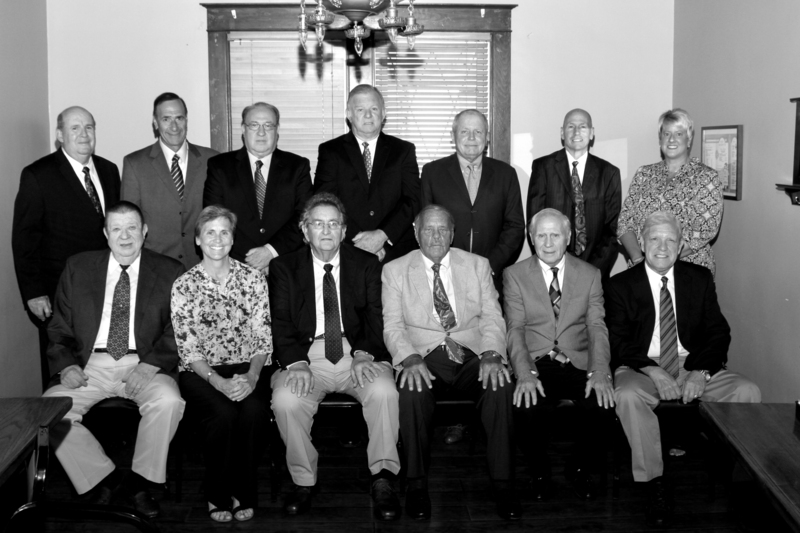 The Fayette County Sports Hall of Fame was founded in the fall of 2008. Fayette County has had an amazingly rich sports history, which dates back to at least the 1920’s, and we encourage you to get in on the ground floor of this exciting opportunity, where you will be able to play a part in helping to recognize and honor Fayette County’s finest. We invite you to become a member of this wonderful organization and to take part in the nominating of new individuals with the possibility of future Induction into the Fayette County Sports Hall of Fame. First Row L-R: Hal Weightman, Becky Franklin, Ken Misiak, Tom Sankovich, Bob Fee, Jim Cunningham. Second Row L-R: Don Woodward, Jim Davis, George Von Benko, Buddy Quertinmont, Chris Cluss, Jes Hutson, Julie Venick. Former Uniontown basketball great Don Yates (right) greets 2009 inductee John Lujack. This is a shot of Golfers in action. Two Connellsville greats together: 2009 inductee John Lujack (right) and former Coker star Jim Cunningham. Uniontown standouts (Left to Right) Tom Hull, Allyn Curry and John Hull. Here are two honored student athletes from Laurel Highlands High School: Jonathan Tobal and Aliana Vignali. 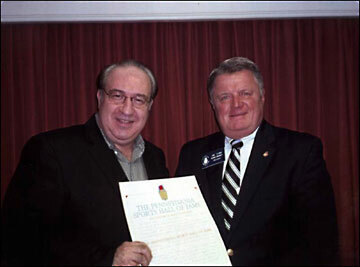 Redstone's Bobby Locke (left) is presented his Hall of Fame plaque by George Von Benko. Here are 2009 Team inductees - 1978 Geibel High School State Basketball Champs. Fayette County Sports Hall of Fame Co-Executive Chair George von Benko accepts the organization's charter from Pennsylvania Sports Hall of Fame president Dr. Stanley Rakowsky. The charter was presented Nov. 1, 2008.